About the Exhibition: Although a gallery usually shows the finished product of an artist’s work, the process is not always appreciated or sought out. However, the finished product would not exist without the progression and development of concepts, emotions, materials and methods into that “thing.” To understand art we must excavate through the physical to find the abstract, conceptual and intangible. 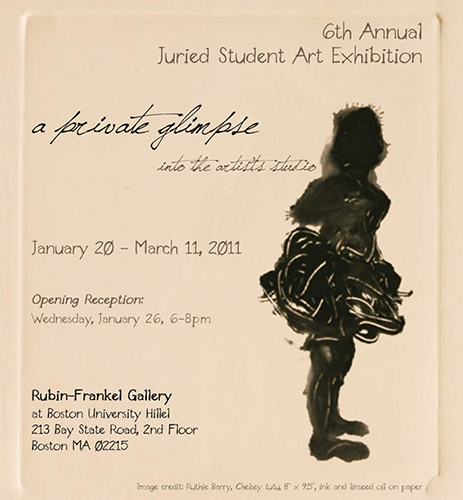 To promote the value of the artist’s process, the Rubin-Frankel Gallery at Boston University’s Hillel will be exhibiting sketches and unfinished studies which focus on the visualization of the artist’s thought process and how the artist sees or goes about trying to see something.